ARMONK, N.Y. - 28 Jun 2016: Every year, the world generates more than 2.7 million tons of a plastic , known as polycarbonates, to create common household items, such as CDs, baby bottles, eyeglass lenses and smartphones. Over time, polycarbonates decompose and leach BPA, a chemical that, in 2008, caused retailers to pull plastic baby bottles from store shelves due to concerns about the potential effects of BPA on the brain. Today, IBM Research (NYSE: IBM) announced that researchers from the Almaden lab in San Jose, Calif. have discovered a new, one-step chemical process that converts polycarbonates into plastics safe for water purification, fiber optics and medical equipment. 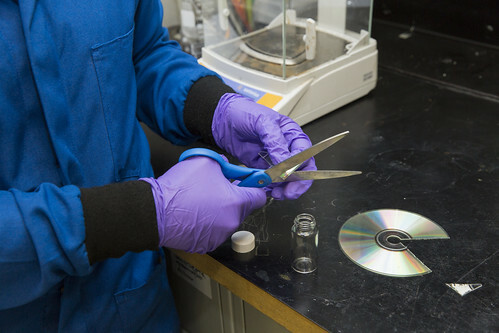 In the study, IBM Researchers added a fluoride reactant, a base (similar to baking powder) and heat to old CDs to produce a new plastic with temperature and chemical resistance superior to the original substance. When the powder is reconstructed into new forms, its strength prevents the decomposition process that causes BPA leaching. In this study, researchers used a combination of predictive modeling and experimental lab work to make the discovery. The learning from these research efforts is also used to advance cognitive systems to help accelerate the materials discovery process. The scale, pace and complexity of materials science is a challenge for scientists working to discover new materials. As part of the IBM Research Frontiers Institute, scientists are combining expertise in informatics and polymers, and other materials, to prototype systems to extract, organize, analyze, and predict insights from materials datasets. By leveraging existing knowledge from the world’s scientific databases and accelerating computations used in these types of experiments, these cognitive tools could help identify patterns and to bring new discoveries to realization faster. IBM Watson Discovery Advisor is an example of a cognitive system available to assist pharmacological researchers in finding new potential drug molecules and IBM’s science research team continues to broaden the domain expertise into new material areas. The full research paper, One-step Conversion of Polycarbonates into Value-added Polyaryl ether sulfones , was published in the peer-reviewed journal, Proceedings of the National Academy of Sciences of the United States of America.